We North Americans are living in a fascinating philanthropic age. Not only has the amount of money invested in good causes risen exponentially, but personal involvement has become today’s mantra. We are blessed with a history and a tax system that supports our generosity. The Government’s encouragement of private Foundations is a rare and very special inducement to so many. The cultural world in our society has been a huge beneficiary of this Government sponsored, personal and corporate largesse. Rarely does a day pass without our seeing and being part of some improvement in the quality of our life as the arts become an ever increasing fixture in our society. While there was an historical elitism tied to the patronage of the arts, today they are available to everyone. Strategic relationships between museums and schools, in public spaces and community facilities are the order of the day. Imagine being an army recruit, spending your weekend at home and then, rather than hitch hiking or taking a series of busses to your base, you are taken to a play, a movie or, indeed, a performance by members of a philharmonic orchestra. What a way to begin a week in the army! Ridiculous? Perhaps, but I’m talking about the Israel Defense Forces. And that’s what really happens. Our Foundation has been the lead funder of what is known as “Sunday Culture in The Army” since its inception, some 18 years ago. Why Sunday Culture? Because the IDF is much more than the normal army. In a country such as Israel, whose Jewish citizens represent over 100 countries in the world, and whose cultural backgrounds are so vastly different, how can some fundamental understanding of all these cultures – real empathy – be gained? The IDF supplies the answer. It is the Israeli “melting pot.” A director or star will discuss the play the soldiers have just seen with them. One of the stars of the movie will talk about the “whys and wherefores” of that film, and/or some members of the Philharmonic will play both Eastern and Western music in order to gain appreciation of their differences. Happily, we are no longer the sole funder. Others have joined. And the program only improves. Andy and I created our Foundation in 1985. As with all start-ups, we learned from our mistakes and today we have a portfolio of philanthropic investments through which we enjoy excellent returns! Philanthropic return is not measured in dollars. It is an achievement based on vision and programmatic goals and objectives. One of our guideposts has been to seek partners through whom we leverage our investments. Nevertheless, even within the constraints of that paradigm I have found that seeking synergy results in greater satisfaction and a more powerful impact. Of course, we do our best to invest in programs that may have secondary effects. And who taught us how to do this? Our parents, naturally! In the early 1950's, my father, Samuel Bronfman, who, as is well known, was the CEO and inspirational leader of Seagram, decided to show the world that Canada was more than just snow and ice and Nelson Eddy dressed in a red Royal Canadian Mounted Police uniform. Dad was a very proud Canadian. He also had a profound interest in selling more of his premium whiskey, “Seagram VO” to world markets. My father thus commissioned 90 paintings and sketches, by more than 20 artists, all chosen by the Royal Canadian Academy of Art, to paint their representations of major Canadian cities and send them on tour. The Seagram Collection of the Cities of Canada traveled almost continuously in 1953-54 visiting Cuba, Mexico, South America, Europe and Scandinavia returning to Canada for a cross-country tour the following two years. (The exhibition did not travel through the United States as “Seagram VO” was already a very big seller in that country!) The result of this artistic initiative was interesting. The Collection was highly regarded in art circles wherever it was exhibited. Unfortunately, this was not the case for “Seagram VO”! No significant increase in sales of that fine brand was noted in any of those markets!!! I was born, raised and lived most of my life in Canada. I, too, am a so grateful to be a Canadian. I had often noticed though, that unlike Americans, my co-citizens didn’t salute their flag with any degree of emotion. How, my colleagues and I asked ourselves, could Canadians come to appreciate their heritage? What was missing? During the bicentennial celebrations of the United States, a thought came to us. Canada lacked heroines, heroes, and myths! Watching the Bicentennial Minutes, we were inspired. And so the Heritage Minutes, one minute television messages about the heritage of the country, its heroes and heroines, was born. We were aware that the quality of the film making, given the sixty second opportunity, would drive its success. This program has since spun off to become a key part of Historica, Canada’s leading organization in promoting history and heritage. I am pleased to report that the artistic quality of these vignettes has, for the first time, made Canadians somewhat curious about their history. Historica, I am sure, will be the avenue for the restructuring and teaching of that subject in Canadian Schools. Following the tragic events of September 11th, Andy believed that culture could help healing. With that, The Gift of New York was created to offer families of the victims of that terrible day, free admission to every museum, cultural venue, sports and entertainment venue in the tri-state metropolitan area. With more than 60,000 visits, 85% of the families used this gift as part of their healing process. Letters from mothers who witnessed their child smile for the first time since September 11 th at a cultural venue confirmed we were in the midst of the cultural synergy inherent in this idea. Andy’s mother had a great eye for art. As well as a love for Israel. It is no wonder, then, that she, a London resident, became the Founding Chair of the British Friends of the Art Museums of Israel. Andy’s pioneering of AIDA, the Association of Israel’s Decorative Arts, along with Dale and Doug Anderson, and me as cheerleader, is, then, no surprise! The ability to exhibit world class works in ceramic, glass, textile and jewelry is always a privilege. We began this program during the middle of the second Intifada, when Israel was regularly facing the nightmare of suicide bombers, terrorism and the death of more than 1,000 of her inhabitants, that created an economic crisis for the entire country. Needless to say, industries related to tourism were those that suffered most. The arts were very high on that sad list. Providing Israeli artists exposure to North American (and now, through COLLECT at the Victoria and Albert Museum, European) galleries and collectors has changed their lives. Dale, Doug and Andy had hoped to lead a mission to Israel of decorative arts aficionados. The trip was well along in the planning stages when that terrible and continuing terror was unleashed. Dale and Andy realized that the trip would have to be postponed. If Americans would be reluctant to go to Israel, was there any way that Israeli artists could be introduced to Americans? If so, where? Doug leaped into action!! A meeting with Mark Lyman and Anne Metsko was arranged. The next thing Andy and I knew, Mark had offered the fledgling AIDA consortium a complimentary booth at SOFA and so the "game was on!!" That was the beginning! Norm and Lis Sandler, well known design architects, volunteered to develop the booth! In order to choose the artists to exhibit at SOFA, a team needed to be put in place. Rivka Saker, who runs Sotheby's in Israel and has become our dear friend, offered her services. Aviva ben Sira, the fabulous "boss" of the Gift Shop at the Eretz Israel Museum in Tel Aviv became the sleuth, and later, so much more, who combed the country in search of qualified artists. Dale agreed to act as curator and asked her friends Jane Adlin, a curator of contemporary decorative arts at the Metropolitan Museum of Art and Davira Taragin, Chief Curator of Exhibitions at the Racine Art Museum to work with her as advisors. Suddenly, it all came about. A resounding success at SOFA Chicago. Followed by SOFA 2004, and now, SOFA 2005!! I have mentioned our parents and their influence on us. Philanthropy was very much an important part of our upbringing by them. Andy's incredible father, known to all as Scotty, instilled in her his passion for supporting those causes near and dear. My dear mother was so very involved in the arts in Canada! To the point that, on her 80th birthday, my siblings and I established the Saidye Bronfman Award for Excellence in the Crafts. It became a Canadian success story, which has done much to elevate the status of that country's artists in that field. The Award celebrates its thirty - fifth anniversary this fall. Andy was having one of those "Big Birthdays" this past May. What to do to mark the occasion became simple. Using the award in my mother's name as a template, and combining that with the success of AIDA, and Andy's love for Israel, the solution was at hand. During the first week of June this year, I had the great pleasure of announcing the establishment of The Andy!!! 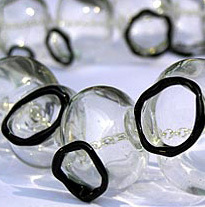 It will be awarded annually to an Israeli decorative artist in the fields of glass, textile, ceramics, or fibre. The winner will receive a cash award and, in addition, will have an exhibition at the Eretz Israel Museum, a catalogue from said exhibition, and a work that will be purchased and donated to the Israel Museum, Jerusalem, in order to "kick start" a collection of contemporary decorative arts at that prestigious institution. Yes, one thing has led to another as we have pursued our philanthropic lives. And every new venture has benefited from past experience. I have taken the liberty to recount this chapter of our philanthropy. Not to blow our collective horn but rather to reflect on the joy that we have had in our involvement We have gained so much. The thrill of accomplishment, the pleasure of knowing that we have helped change people's lives, and, perhaps, what has been the most meaningful to us - the great friendships we will always cherish of those who have been our mentors and have become so happily entwined in our lives.